A few miles northeast of Fresno, Chris Pluhar walks through a field pockmarked with little holes. It’s dry, scrubby and surrounded by rolling brown hills. You’d never know that in a normal year, where he’s standing would be under 20 feet of water. It’s usually a part of Millerton Lake, a major but rapidly shrinking reservoir in the Sierra foothills. Right now, Millerton’s filled to about a third of its total capacity. The high water line scars the hillside far above Pluhar’s head, and some boat ramps lead to nowhere. 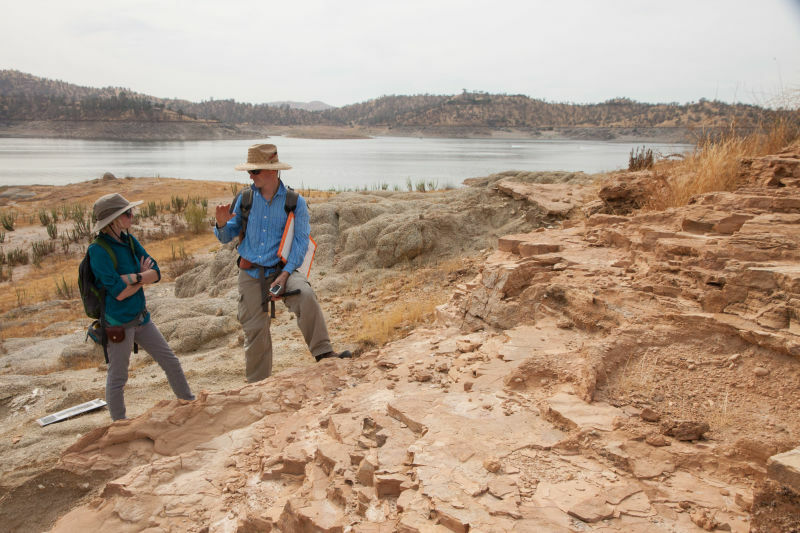 While most people overlooking Millerton would see only a shriveled reservoir, Pluhar saw an opportunity: he could study rocks revealed for the first time in years. Pluhar studies tectonics—the process by which geologic plates pull apart and jam together to form ridges and mountains—and he’s interested in what these rocks can tell him about the Sierra Nevada. So he brought along a student to help figure it out. Wynter Erickson is mapping this area for her senior thesis—a process that involves tracking the boundaries between rock layers and measuring how much they’ve tilted. 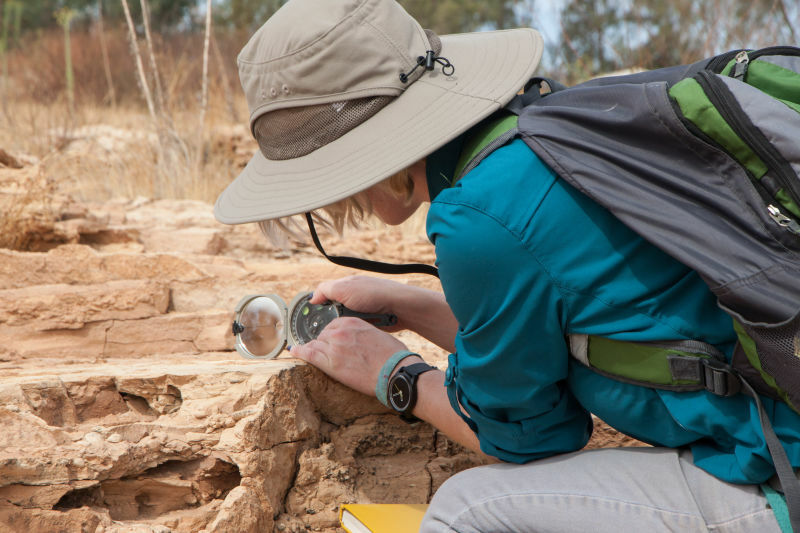 These geologists are piecing together pre-history. Some of the rocks here formed more than 100 million years ago, long before the Sierra began to rise. Pluhar hopes Erickson’s measurements will help answer an important question: when did the mountains grow to their current size? And how quickly? The Sierra is a jumble of sediments transported from the deep ocean and piled up on top of the continent, with scars of granite and lava from defunct volcanoes. Its history is complex, and it’s not easy to figure out what happened when. There’s no telling if this one little part of the foothills will resolve a big, longstanding scientific debate. But one thing is certain: now is the time to investigate. As worrisome as that is, Lund says it does present some rare opportunities. Lund also says drought years are the best time to perform maintenance and repairs on dams. 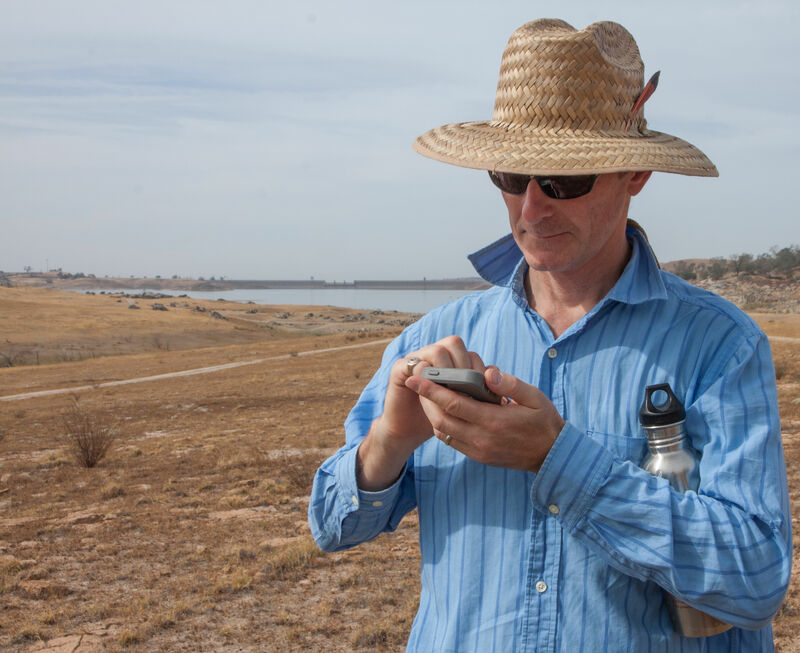 He’s hopeful that an El Niño winter will top up the state’s thirsty reservoirs. But he’s quick to point out that high water levels wouldn’t mean all of the state’s water worries are over. It’s hard to find an upside when farms are going fallow and thousands of people are out of drinking water. But back in the parched basin of Millerton Lake, Wynter Erickson is excited that she’s in the right place at the right time to make something good of the drought. By the time she and Pluhar finish their maps, their field site will once again be at the bottom of a lake—at least, one can hope.